Kim is originally from Western Australia were she worked in the WA public service in the areas of Housing and Education before moving into the not for profit alcohol and other drug sector. She moved to Darwin in December 2000 to take up a position at the Council for Aboriginal Alcohol Program Services (CAAPS). After 8 years as the CEO of CAAPS Kim was recruited as the Deputy Director at the Office of Aboriginal and Torres Strait Islander Health (OATSIH) in the then Department of Health and Ageing. Kim has also worked in the NT government for a short period of time, in the Department of Health and the Department of Justice. Kim held the position of Deputy Director with NTAHC since November 2012 prior to her appointment as Executive Director in March 2014. 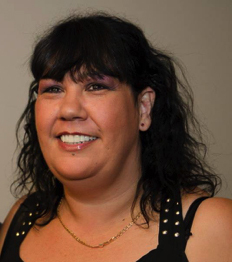 Kim holds a Masters in Indigenous Health and a Graduate Diploma in Indigenous Health from Sydney University and a Certificate 4 in Workplace Training and Assessment. Kim supports “Harm Reduction Australia” to reduce stigma and discrimination against people who use drugs through the continuous development of initiatives that reduce drug-related harm across Australia that ensure that the rights and needs of people who use drugs are considered throughout all stages of policy formulation, planning, service delivery and evaluation.